I’m really enjoying the Windows 7 build that I’m running. It really does seem to run smoother and quicker than Windows Vista. Even after I installed all the programs I had running on my Vista build it still feels quicker. I have had no problems with drivers or programs installing. It has taken a bit of time to get use to the new Taskbar. 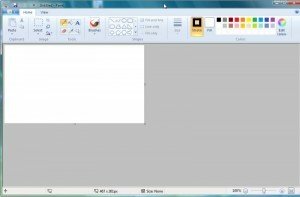 The Taskbar allows for granular control of how the tray items are treated. 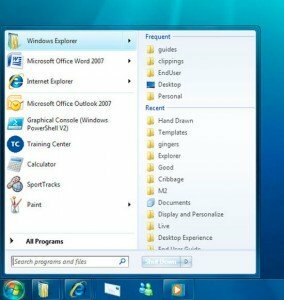 The ability to pin programs to the Taskbar allows you to keep your most used programs locked in the Taskbar if they are running or not. This feature keeps you Taskbar cleaner. Here is a screenshot of the new Start menu and the Taskbar. Windows 7 has some UI changes on Calculator and Paint. 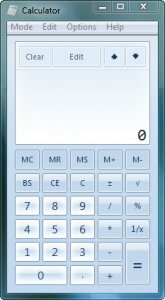 Here are some screenshots of the new Calculator and Paint UI’s. I have noticed that the desktop slideshow seems a little buggy. When I have a slideshow running the background seems to go a little wacky. One time I lost the minimize, maximize, and close buttons in the top right of all the windows. After setting the background to a static background to this UI bug seems to have gone away.